God reveals His plan for a Word of Faith church in Toronto to our founder, Bishop Keith A. Butler. Word of Faith International Christian Centre held its first meeting at 5pm at Canada Christian College. The church celebrated its 5-year anniversary with Bishop Keith and Pastor Deborah Butler as special guests. Bishop Butler installed Pastor John and Pastor Cheryl Ward as the Senior Pastors of Word of Faith Toronto. 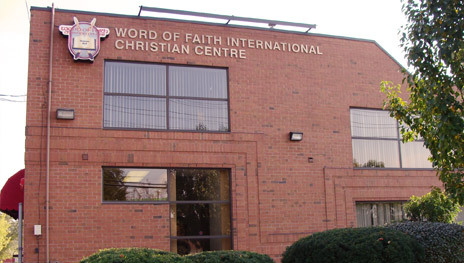 Word of Faith International Christian Centre-Toronto was founded by Bishop Keith A. Butler. In keeping with the apostle’s calling that is upon Bishop Butler’s life, the Lord told him that he would be bringing the Gospel to Toronto, Ontario. In 2003, the Lord told Bishop that it was time and that this was the season to start the work in Toronto. The work began in October, 2003 with a dynamic 2-day crusade. The crusade meetings were held on October 16 and 17 at Toronto’s International Center. Over 260 people came out each night to hear the anointed Word of God come forth from Bishop Butler as he preached on Divine Protection and Divine Provision. Lives were changed and prayers were answered as God’s plan for a Word of Faith church in Toronto was revealed. On Sunday, January 11, 2004, Word of Faith International Christian Centre held its first meeting at 5 pm at Canada Christian College. Despite the cold and the snow storm, over 150 people who were hungry for the Word pressed their way from all over the Toronto area to attend this first meeting. For 6 months, faithful volunteers were brought in from Southfield, by plane and by vans, each Sunday to serve as ushers, hostesses, bookstore workers, sound engineers, and the praise and worship team. By March, 137 people were coming out for the Sunday services. In March, Bishop Butler began our Children’s Church to minister the Word of God to the children, ages 4-11. Bishop also began a Thursday midweek service in March and the church continued to grow in the Word and in size. Bishop Butler continued to fly into Toronto for the Sunday service, ministering on faith, authority of the believer, prosperity, and healing. Word of Faith’s dynamic, power-packed Glorify God Youth services began on Thursday, June 24. In 2005, Bishop Butler installed Pastor Robert and Min. Grace Martin as the Senior Pastors for Word of Faith International Christian Centre. The church continued to grow and prosper and the search was intensified to find our own building. That search ended in 2006, when Word of Faith held its first Sunday service in its own building at 65 Sunrise Avenue. The church continued to grow and many new ministries were instituted: Touch Groups, Soul Winning Attack Team (SWAT), Women of Virtue, Men of Valour, Vacation Bible School, and an annual Back to School Rally. In 2006, Laypersons Bible School began and the Bible Training Centre began with 26 people in September, 2007. On January 10, 2009, the church celebrated its 5 year anniversary with Bishop and Pastor Deborah Butler as our special guests and keynote speakers. On July 11, 2010, Bishop Butler installed Pastor John and Pastor Cheryl Ward as the Senior Pastors. Pastor Martin received a promotion to the Word of Faith-Southfield church. With great love and honor, the congregation pronounced blessings upon Pastor Martin and warmly received Pastor Ward as Pastor. Word of Faith – Southfield is located in the Detroit metropolitan area. WOFICC mission is to provide an environment in which people from every race, creed and nationality can come and find a place of belonging and acceptance; a place that they can come and be fed the Word of God; a place they can call home. Word of Faith is a large church and does not apologize for that. We see this as a positive attribute. There are just simply more of us to love you, care for you, and pray for you.